Was it just me, or did this episode feel super long for some reason? Well, it might be just me. I have a terrible cold right now! Like, I could hardly sleep last night because I had such a terrible sinus headache bad. So much fun! As you may remember from the previous episode, Lucifer revealed he had... plans? Okay. Some sort of vague big plans. Which turn out to include possessing a big philanthropist followed by an archbishop. 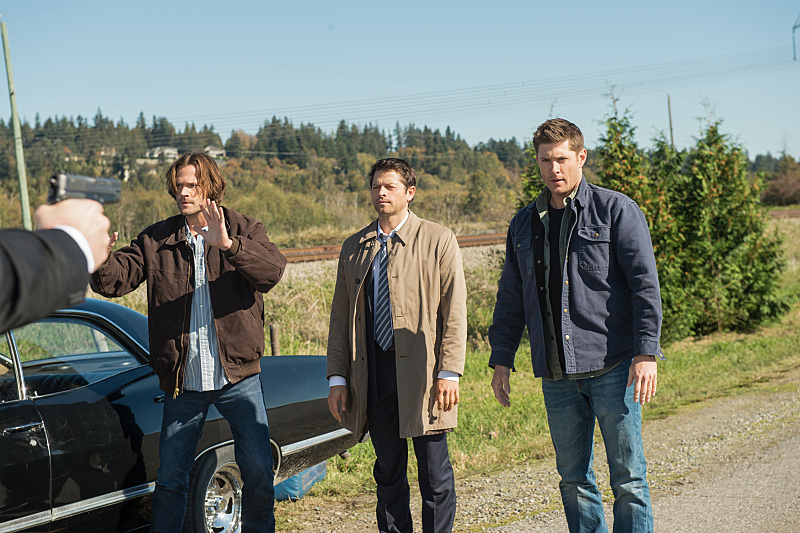 The boys, plus Castiel and Crowley, find this trail, but aren't sure who he could be heading to next, only that he's upping his game from regular joes to big-time people. Enter President Jefferson Rooney aka David Chisum! Who, thankfully, is a much better actor than Rick Springfield. Lucifer must spin him some yarn about how he can help make the world a better place with him together, though I find it hard to believe that a true religious person as Jeff is made out to be would actually believe such things. Nonetheless, he accepts Lucifer and promptly kills one of his guards for butting in on a self-talk session. That unnatural death is what ultimately leads the boys to figure out who he's possessing, thanks to a member of his team being on Crowley's soulroll (you know, payroll, but for souls. You get it.). Problem is, while they may know who Lucifer is possessing, that doesn't make it any easier to get close to him. You know, Secret Service and all kinds of other security and all. 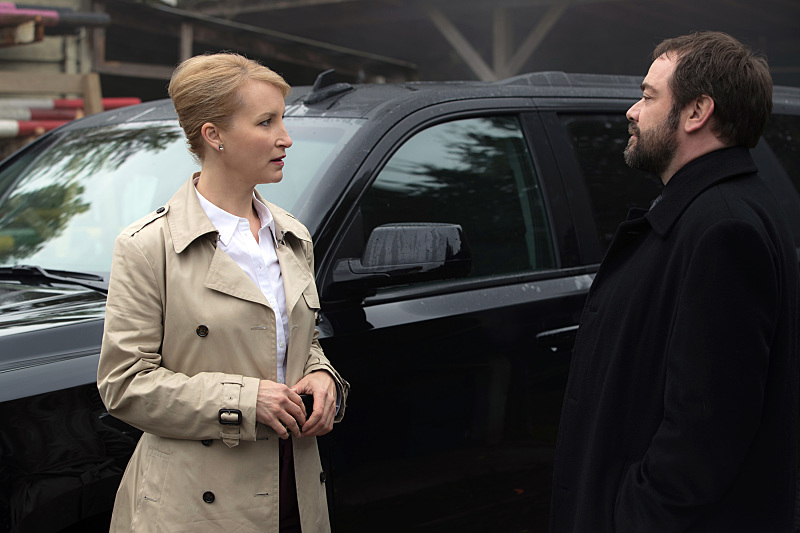 Still, Crowley heads off to recruit Rowena for backup in taking Lucifer down again. Lucifer has other ideas, though, as he tells his secret service that there are some fanatics on their way to assassinate him - you know, the Winchesters. The secret service tracks them down and they all get into some fisticuffs, but then wouldn't you know it, Mr. Catch shows up to save the day. You see, Sam tried calling up the British Men of Letters earlier on to possibly help with the Lucifer situation, but he never actually talked to anyone. That doesn't stop Mr. Catch from showing up. And guess what! He has some special device that can expel angels from their hosted bodies! What luck! Meanwhile, Castiel hears a big hit on angel radio - a Nephilim has been conceived - you know, a child of an angel and a human. Turns out, President Jeff was getting it on with one of his aides, Kelly, and Lucifer decided he'd like to create a little somethin' somethin' with her. The boys are able to use this to their advantage, by being able to lure Lucifer to where they are by kidnapping Kelly. He shows up, and the egg angel-expeller works! Well, with some apparent help from Rowena. Would it have worked on its own otherwise, who knows? Lucifer is expelled from the President's body, leaving him alive. 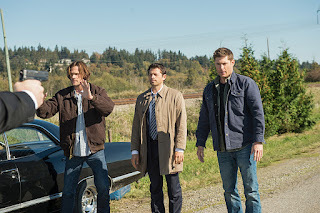 Crowley and Rowena pop away, Castiel takes Kelly out a back entrance, but the boys remain with the President for who knows why, only to be arrested by the secret service for an attempted assassination. 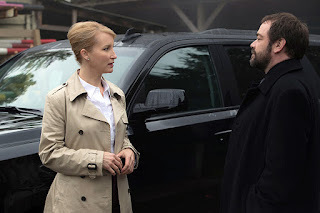 And, even though Kelly knows that her child is the son of the devil, she doesn't want to have the pregnancy terminated, so she escapes from Castiel all too easily. Castiel, come on. Well, that's it for awhile - the show doesn't return until January 26. So, until then, wish this terrible cold adieu! - I honestly can't even think straight enough right now to come up with random thoughts. Hit the comments with your own, if you have some! Lucifer: It's almost like I've never done that before. Sam: Can we get the info without all the drama? Crowley: Can I get you without the flannel? No, and still I endure. Rowena: That is the sweetest thing you've ever done for me. Dean: Lucifer? I didn't know he was dating.